Co-operative Energy is set to harness the power of sports fans with the announcement of a major new sponsorship agreement with Supporters Direct. Co-operative Energy is to become the Official Energy Partner to Supporters Direct in a two year deal lasting until 2016, with fans set to benefit from simplified, competitive tariffs and Supporters Trusts given access to a profit sharing agreement which will see funds pumped back into Supporter Initiatives. 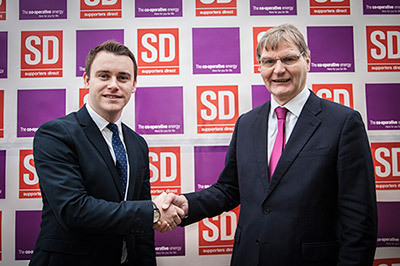 The agreement will also see Co-operative Energy supporting Supporters Direct's core work in with Rugby League, Premier League, Football League and Non-League clubs the length of the country, which aims to encourage sustainability and supporter involvement in the game. In addition to securing a set of commercial rights the partnership deal will see Co-operative Energy working closely with all of the Supporters' Trusts in England and Wales to promote environmental awareness, in particular energy efficiency, and help communicate some of the practical solutions that will move them to a more sustainable future. Speaking at the launch of the sponsorship deal, Co-operative Energy General Manager Ramsay Dunning said: "We are looking forward to building a successful relationship with Supporters Direct over the next two seasons. Co-operative Energy has not only been identified for our simplified tariffs but we have been recognised in the industry for our outstanding customer service. We will be bringing this to a new network of supporters up and down the country and we look forward to developing this partnership. And Commercial Manager at Supporters Direct, Mark Bullock said: "I am delighted to welcome Co-operative Energy as the Official Energy Partner to Supporters Direct. Their involvement is representative of our shared cooperative values and celebrates the success of the supporters trust movement in the U.K.
Their support for our core work is particularly encouraging and the partnership allows Supporters Trusts to generate an important residual income which will reinforce the organisations' community benefit. 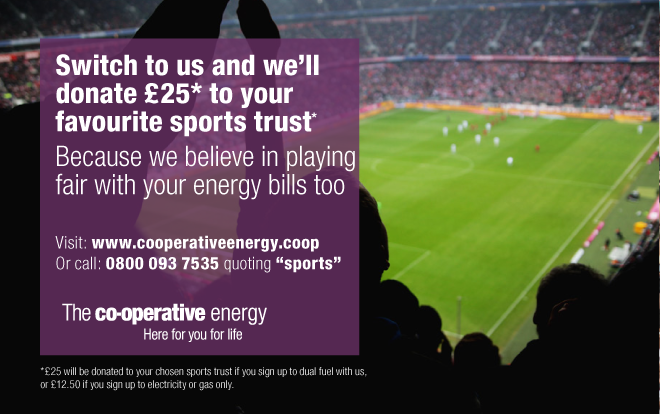 Strengthening the Supporters Trust network is at the top of our agenda and we welcome Cooperative Energy to our growing list of commercial partners in the current season and look forward to a successful relationship." Co-operative Energy, which is part of The Midcounties Co-operative, now has 200,000 customers.